For a company to compete effectively in today's business environment, its employees need to be adaptive and agile so they can develop the required skills and knowledge. To achieve this, L&D professionals must create a culture of workplace learning that encourages employees to constantly develop. This means moving away from the traditional approach of simply offering a catalogue of courses to embedding learning in every part of the company. 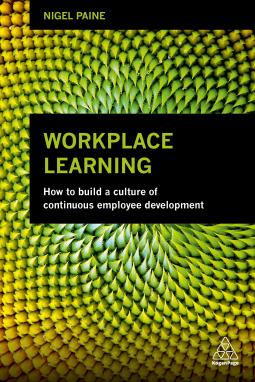 Workplace Learning is a practical guide to all aspects of developing a culture of continuous workplace learning, from how to introduce and implement this culture to how to develop it. Showing that learning is not finite and is instead something that all employees should be doing continuously throughout their careers, Workplace Learning covers how to identify key areas to focus the most effort on, measure success and determine next steps. It also outlines how to use technology to support workplace learning from MOOCs through to apps such as Knewton and Degreed. Packed with case studies from organizations who have effectively established outstanding workplace learning including Microsoft, PricewaterhouseCoopers (PwC), HT2 and The Happy Company, this is essential reading for L&D professionals looking to make a real difference to the development of their staff and the future success of their organizations. I'm working as project manager on training projects and this was the right book to improve my working experience and to have a better understandment of this topic. I will surely apply some of the ideas in this book. Thanks to Kogan Page and NetGalley for the Advance Review Copy. It's difficult to argue against any of the messages in this book as it's all basically common sense. Workplaces need to value learning and put the conditions in place to enable it to take place and this book argues that leaders need to make this a priority. The content and of the book is based on extensive research and theory with numerous useful case studies to exemplify the message. Practical steps and suggestions are given to help enable leaders within organisations to create a learning culture. Of particular interest to me was the suggestion that Learning and Development practitioners need to work in partnership with organisations and not just provide a catalogue of courses. Practitioners must move from being trainers to facilitators. This is something that I have the freedom to do in my current role but it's good to hear this approach being backed up with current theory and research. The book also touches on current and future challenged in 'the age of instability' and the need for meaningful collaboration in order to problem solve some of these issues lurking on the horizon. The book is well structured and there is lots to unpack but there are summaries of each chapter which help if you need to dip in and out of the book or need a refresher on certain topics. I'd highly recommend this for current and aspiring leaders and those working in organisational development and L&D.